In the summer of 2010 Petri Suorsa, Janne Leppänen and Reima Hyytiäinen fitted an extremely large crane colt with a satellite transmitter. 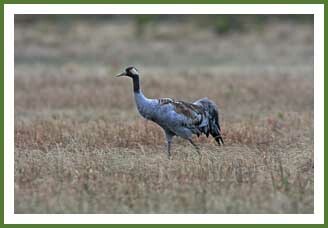 Given the body size and presuming the forthcoming overwintering grounds the crane colt was named as “Goljatti meaning Goliath, giant”. The first two weeks after the deployment Goljatti foraged at a radius of 2 km of the territory centre. Then foraging trips started to extend 5 km away the nest site. In September the crane regularly roosted overnight on the islands in Ruvaslahti-bay. 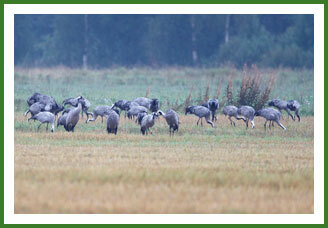 Just prior to migration the crane family joined the major roost at Viklinsuo-bog, Polvijärvi. 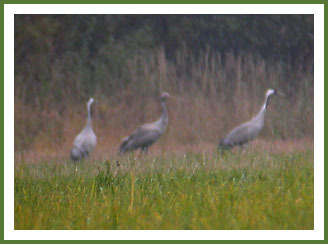 On September 26th 2010 Goljatti took part in a mass migration of North-Karlia’s crane population and headed SW to Estonia. 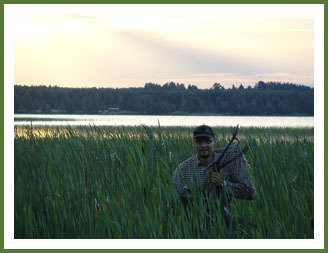 Renttimä is an adult Eurasian crane that was captured by Matti Tolvanen and fitted with a satellite transmitter by Matti Suopajärvi in Savukoski –municipality, Finland in the spring of 2008. The location data of Renttimä has so far proved that Finnish cranes are able to overwinter in the Balkans, more precisely at Slano Kopovo, N-Serbia and at Jelas Polje, Croatia. More importantly the same individual crane may drastically alter its between-year migration tactics as shown by Renttimä who revealed a new overwintering area for Finnish cranes from N-Libya by the S shore of the Gulf of Sirdra in 2009-2010. Further, in the spring of 2010 the crane returned via the Adriatic flyway and stopped over in Montenegro which is a new staging area for Finish cranes. The transmitter of Renttimä should have ¼ of the transmission hours left. We should thus be able to monitor a good deal of the third forthcoming migration season 2010-2011. 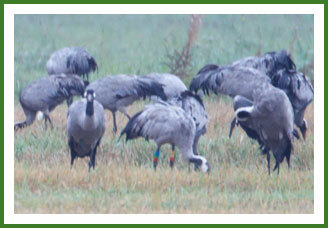 Inka is an adult female Eurasian crane that was captured by Olli-Pekka Karlin from the northernmost breeding population of the Eurasian crane in the field season of 2009. We want to thank Kari Tikkanen, Juhani Honkola and Esko Sirjola for their great help in the field. Inka used the autumn migration route via the Adriatic flyway to the overwintering area in western Algeria, North Africa. Unlike, Aino-crane who returned via the western flyway, Inka returned by following the autumn route and stopped over in Italy, Croatia and Rumania. Inka failed to produce any offspring in 2010 may be owing to too challenging weather conditions in northern Lapland, Finland. Inka’s transmitter should have plenty of transmission hours left to allow for monitoring her journeys in 2010 - 2012. Janne Leppänen and ”Goljatti” on August 1st 2010. Petri Suorsa releases Goljatti after fitting the transmitter to the crane colt. Renttimä in a flock of 100 adult crane individuals that have failed in nesting. Photographed in Ala-Temmes on August 22nd 2010. Inka wades in the breeding territory in Ivalo, Finland.